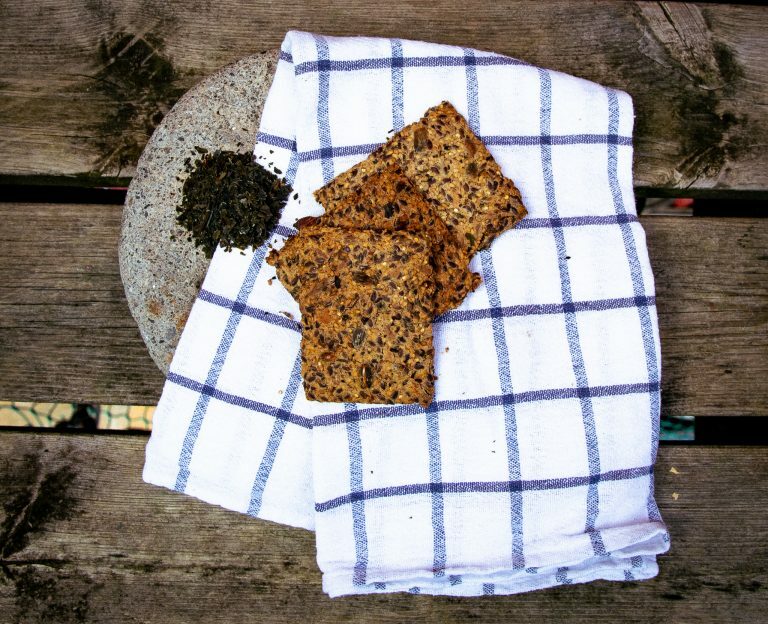 Seaweed crackers - Lofoten Seaweed | From Lofoten, Weed Love. 1. Pre-heat your oven to 180 °C. Line two baking trays with parchment paper. 3. Put half of the mixture over one of the trays and spread evenly and thinly. You can use the back of a spatula, or lay baking parchment or plastic wrap over the top of the mixture, pressing down and spreading to get an even thickness. 4. Score the unbaked knekkebrød with a knife or pizza-cutter to make breaking it up after baking easier. 5. Bake in the pre-heated oven for about 30-35 minutes, keeping an eye on them and rotating the trays if needed. 6. Take the baking tray out of the oven and allow it to cool until it is easy to handle.